Another year, another Exynos SoC. After teasing the Exynos 9 last week, Samsung has officially unveiled its new line of mobile chips. Samsung's Exynos chipsets are arguably the last remaining major competitor to Qualcomm's Snapdragon series, after both TI and Intel ceased manufacturing mobile processors and the loss of popularity of Nvidia's Tegra lineup among smartphones, and showcase the company's best efforts in developing an in-house SoC. 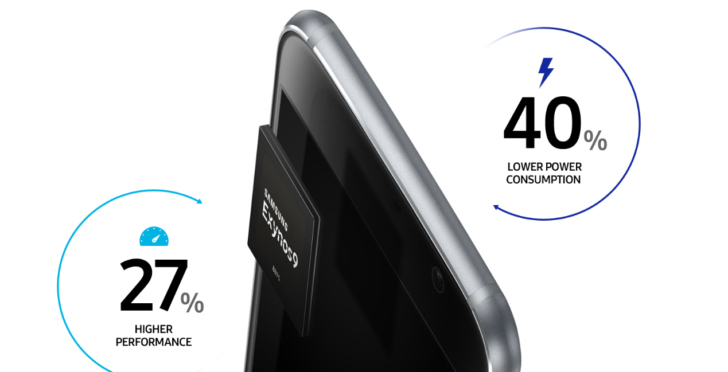 The new Exynos 9 Series 8895 is Samsung's first to be manufactured using a 10nm process, improving its performance by 27% while consuming 40% less power when compared to the 14nm structure used on last year's Exynos 8 chips. The upgraded LTE modem on the Series 8895 supports download speeds of up to 1Gbps with 5CA (five carrier aggregation) and upload speeds reaching 150Mbps. Samsung has been investing heavily in the Exynos 9's video and photo capabilities as well: the new processor can record and play video at 120fps in 4K resolution, making it perfectly suited for almost any mobile VR applications consumers can dream up. The chip can also handle a camera setup of up to 28MP on both the front and back, or a 28MP+16MP dual camera. Obviously, these numbers are the chip's theoretical limits and aren't necessarily indicative of the sort of specs we can expect to see on a new Galaxy S8 or Note 8, but at least we can be pretty certain that it won't have have a 5K display or a 29MP camera. Probably. Samsung hasn't yet announced any new hardware to showcase its new SoC, but if history is any guide, we can likly expect to see it on some of this year's Galaxy flagships.